High Intensity Mixers are used when a product needs to be heated up while mixing. The mechanical shear action of the spinning blades creates the heat needed to raise the temperature of the materials to be mixed. 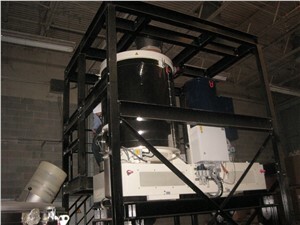 Many high intensity mixers are followed by a cooling unit and are know as a mixer/cooler combination. There are horizontal or vertical mixer designs based the product specifications. Typical products mixed in high intensity mixers are PVC,color concentrates and pigments, polyolefins, and thermoplastics. Arlington carries a wide variety of manufacturers including Gunther Papenmeier, Littleford, Prodex Henschel and MTI.